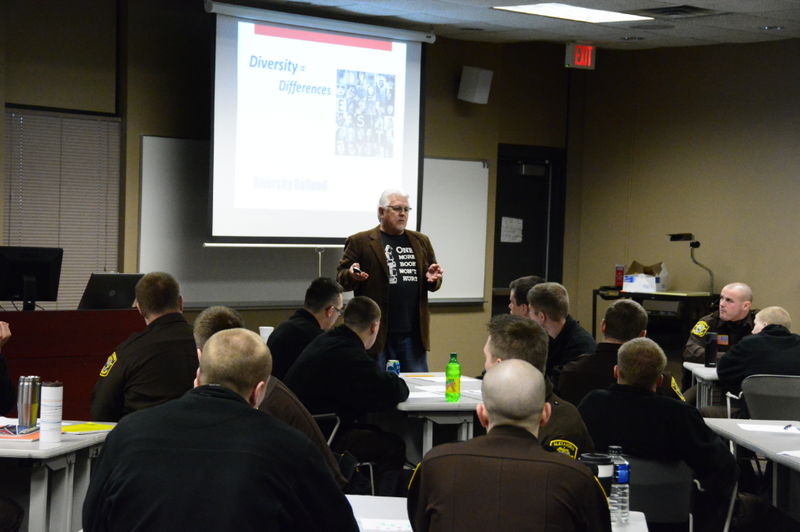 Trainers from the Inclusion Network in Alexandria, MN hold a diversity training with law enforcement students at Alexandria Technical and Community College. Alexandria, MN is among the top fastest growing small cities in the U.S. This “micropolitan” city of less than 12,000 is home to the 3M Plant and an increasing immigrant population. Like many cities nationwide, Alexandria is seeking to raise the conversation about diversity and law enforcement. Last fall, Alexandria’s Inclusion Network conducted a two-day training for first-year law enforcement students at the Alexandria Technical and Community College. Graduates from the program frequently apply for the state patrol or end up serving at departments and agencies across the country, including border patrol. The Inclusion Network, which facilitates conversations about diversity within the city, had hosted a screening of Not In Our Town documentary, Waking in Oak Creek, at one of their monthly conversations last year. Network member and college Chief Diversity Officer Debra LaDoux also used the film in the inclusion and diversity training for the students in the “Diversity, Community Policing, Domestic Abuse and Victimization” class, which is lead by instructor Deb Martin. The video is a testament to the difficult and heartbreaking work citizens and law enforcement have to embrace to rise above the hatred inspired by fear of difference that, in turn, inspires such deplorable criminal acts. No community is immune from such a thing happening. The heart of a community is not defined by what has happened, but rather by how the community, including law enforcement, chooses to respond. In addition to working with the law enforcement program at Alexandria Technical and Community College, the Inclusion Network works on issues of bullying, including workplace bullying, and within the faith community. Bring Waking in Oak Creek to your town. Request a free DVD here.